In the first part of this blog we analysed the size and shape of the Tic-Tac-Toe (TTT), or Noughts and Crosses, game tree. We managed to prune it down from over 500,000 nodes to a few hundred by accounting for duplicated and symmetrical positions, and by considering forced moves. Can either player force a win? What is the best move in a given position? In this blog we look at player strategy, TTT opening theory and position evaluation. In general play, TTT presents each player with a number of alternative moves. While it is often clear near the end of the game that a position is a win, loss or draw, it is generally much harder towards the beginning to assess where a particular move will lead. It is a bit like following a jungle trail only to encounter a fork in the path. Without a signpost, or some other indication, it is impossible to know which path to take – one might lead to a friendly village, the other to a lions’ lair. What we need is someone to walk the paths in the reverse direction and at each fork, signpost where it leads. We can use this approach on the TTT game tree. As all the terminal or leaf nodes are always a known result – win, loss or draw – we can work backwards and “signpost” the internal nodes. 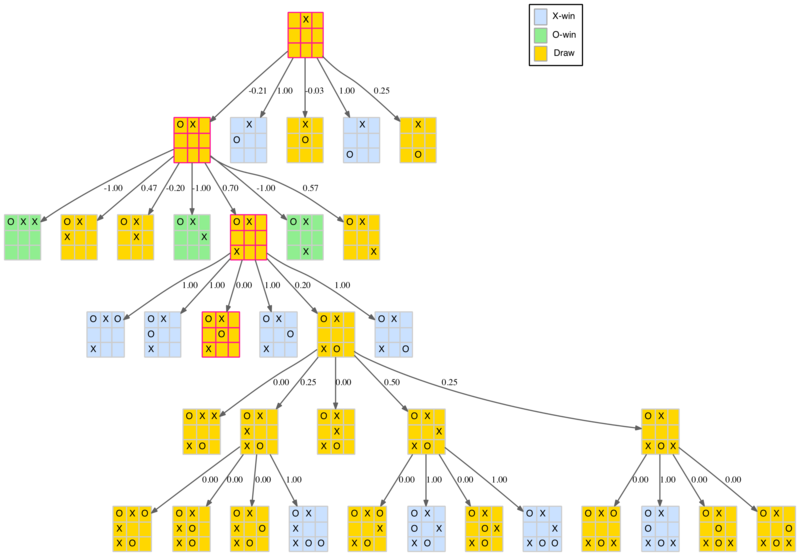 This is known as a min-max tree and it is used extensively in game analysis. Note we are going to use a very basic non-optimised implementation here. Some of the same part 1 helper functions will be used in this blog. These are repeated below for convenience. The first generates all available moves. The second tests if a position is a win for the specified player. "Return a list of all valid moves on the specified board or nil"
"Determine if a board is a win for a given player." The tree walking code is shown below. 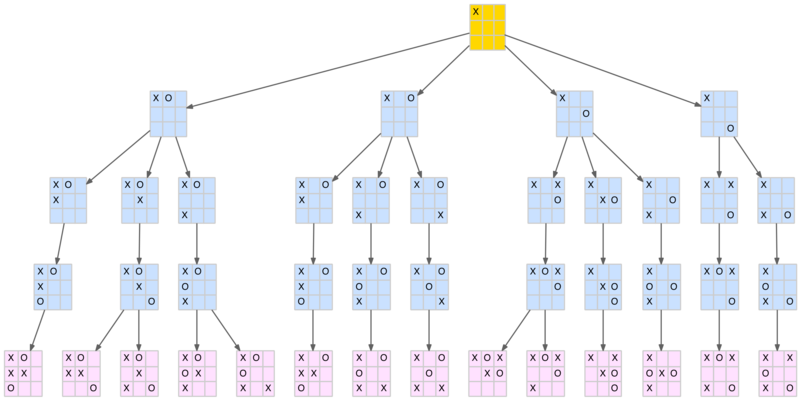 It is similar to that used in part 1 but in this case simply returns the score from each node. For terminal nodes this is +1, 0, or -1 depending on the X-player’s result: win, draw or loss. For internal nodes, it returns either the maximum score of all the available moves, when those moves would be made by the X-player, or the minimum score of all the available moves, when those moves would be made by the O-player. It does this by selecting either the min or max function, depending on the next player, and applying it to the resulting scores returned by all the moves for that player. each node using min-max analysis." This function can test any position to determine the outcome assuming each player makes the “best” move at each opportunity. The best move for the X-player is the one with the highest score, while the best move for the O-player is the one with the lowest score. If the function returns +1, it means the X-player can force a win, if it returns -1, it mean the O-player can force a win, if it returns 0 then neither player can force a win and the position can only be drawn. What is this diagram telling us? Well, firstly, it answers the first question at the start of this blog – can either player force a win? The fact that the initial blank board returns a draw indicates that if each player plays their best moves from the start of the game, it is always a draw. This will not surprise anyone who has played TTT, after a while it becomes evident that every game ends in a draw when played by experienced players. It is further illustrated by the fact that all three of the X-player’s opening moves – corner, edge and centre – are also draws, which must be the case, otherwise there would be an opening move that forces a win and the blank board wouldn’t be a draw. Secondly, it highlights the importance of the O-player’s responses to the opening moves. Of the 12 possible replies, 7 (58%) result in wins for the X-player (ie. losses for the O-player). Indeed, for the opening corner move, only one of the five possible (distinct) responses results in a draw, the other four are all losses for the O-player. These could be summarised for the O-player’s first move as: always play in the centre if available, otherwise play in a corner. Later we will see that for the edge move, the O-player has a better option than the centre, although the outcome is still a draw. While the min-max function can determine the result for any position, it is silent on how to win or draw that position. For example, it doesn’t give any direct guidance as to how the X-player should proceed to win the seven winning positions in the above diagram, should the O-player stray down one of those paths. However, by applying it to each node in the tree, it is possible to score (or colour in our case) that node. This illuminates the path, or paths, to the final goal. The reader has probably already realised that the X-player’s winning positions arise because they can be turned into a forked position (a position where there are two two-in-a-row threats of which the opponent can only block one). In many cases, there are several ways to create a fork from these positions. The following diagrams show all the ways to force a forked position (shown in pink), and therefore a win, from the seven losing O-player responses. It is not really necessary to memorise these as with a little practice you can look ahead and visualise the forked position(s). This guides you to the correct play. It is more important to know when a position is winning (or losing) so you can search for the correct play to reach the forked position. It is worth noting that all the paths to a forked position in these cases starts with the X-player making a forcing move (ie. one that requires the O-player to block immediately). Of course, if you are playing a novice, and you have egotistical tendencies, it is worth varying the opening move orientation and type of fork as much as possible, to reduce the chance that the pattern will be recognised and avoided in the future. After all, toast is toast. These conditions mean the tree only extends as far as either an inevitable win/loss or a pedestrian draw (ie. no fork positions – traps – are possible) position. This tree represents the essential essence of the game as all the “traps” are exposed and the path to a draw is clear. However, it does not extend into the details of how to win the won positions or how to draw the drawn ones. The former is left to the reader (with some examples above), the latter is just a matter of blocking any two-in-a-row threats (safe in the knowledge that there are no forks lurking). This makes the tree fairly compact and concise. For the remainder of the blog, this tree will be referred to as the reduced game tree. The diagram below shows the opening corner move branch of the reduced game tree. What can we glean from this branch of the tree? Well, the second level is as described earlier with four of the five O-player responses resulting in X-player wins. After the O-player’s (forced) centre play there are four (distinct) X-player responses. The first two are pedestrian draws (provided each player just blocks correctly). The last two moves are a bit more interesting as they can lead to forked positions. The last play (opposite corner) sets a small but fairly obvious trap. The O-player must now play an edge, not a corner move. After that it is a standard draw. The third move (opposite edge) is the most interesting. It sets up a couple of immediate losing options for the O-player, as well as two more at level 6 (far left branch). It also shows, for the first time, that the O-player can set a trap as well (path to the green node) by playing in the bottom-right corner. In summary, after the corner opening and (forced) centre reply position, the X-player has the opposite corner for a simple and safe trap, or the more edgy (excuse the pun) opposite edge that has a few more traps including one for the O-player. In this line, the O-player needs to navigate around the blue positions above to achieve a draw. Now let’s look at the opening centre move of the reduced game tree. As mentioned above, the O-player must play in a corner to avoid defeat. After that the X-player has four (distinct) plays. All but the last – opposite corner – lead to standard draws, or even a possible loss in the case of the bottom left path. But after the opposite corner play, the O-player must play in the corner again to force a draw. So the somewhat benign looking opposite corner is actually a little tricky. The next, and last, of the X-player’s opening moves is the edge play. You might expect this to yield a similarly compact reduced tree as the other two. However, it actually produces a bit of a monster with 95 nodes. To fit it in the blog it has been broken down into the three, level 2 responses, that aren’t direct wins for the X-player. Once the tree gets this large it is more difficult to analyse by hand (or eye). Can we develop a scoring system and apply the min-max approach to the reduced tree in the same way we did for the entire tree above? The second question at the start of this blog was: what is the best move in a given position? This question assumes we have a definition of “best”. If we work with the reduced tree where we stop and mark a node as terminal (or leaf), if it leads to an inevitable win, loss or standard draw (assuming sensible blocking aways occurs), we can use the same approach as above. Scoring from the X-player’s perspective, we can mark a win as +1, a loss as -1, and a draw as 0. Each node’s score is shown on the link to that node. All the symmetric links are included (red lines) so the average score is a true representation of all the available moves. The corner-play branch of this tree, which has the highest scoring (0.89) first move, is shown below. By applying the min-max rule we can plot a path for the “best” move for each player. For the X-player’s move we choose the move with the highest score, for the O-player’s move we choose the lowest. The path is highlighted in the above diagram. This notionally represents the best TTT game possible, or at least the first four moves. On the fifth move the X-player has a choice of four moves which, of course, all end in a standard draw (with correct blocking play). In particular, the “best” game now takes a different path as shown in the revised corner branch below. Briefly returning to the opening edge play which we skipped earlier as the tree was quite large. With the aid of the position scores, it is now easy to see that the O-player’s best response is a corner on the same edge. As shown in the partial tree below, this creates three losing options (out of seven distinct plays) for the X-player. The X-player’s best reply is the same corner on the opposite edge, which then leads to a draw once the O-player plays in the centre. The initial edge play is technically the weakest from the X-player’s perspective. It opens the way for many forked positions on both sides, but perhaps because of this, it is also the most interesting in many ways. This completes the TTT strategic analysis. The links to the full reduced game trees above (especially the last two) provide a clear and concise description of the complete TTT game. In a sense they capture the essence of the game including a realistic score for each key position. In part 1 of this blog we discovered that all drawn positions form one of the following three patterns. Clearly the X-player can always force the Island pattern by playing in the centre on the first move (as it is the only pattern with an “X” in the centre). But what about the other two? Can the X-player force the game to a particular drawn pattern? We can modify the earlier min-max code to distinguish between different drawn patterns and assign a non-zero score to the one we are interested in testing. A helper function, to determine the draw type, and the modified min-max code is shown below. "Examine the specified board and return the drawn pattern type"
By setting the win and loss scores up to +10 and -10, some room is made to give a small integer score to the drawn patterns (of course we could use fractional scores but this keeps changes to a minimum). Using +1 for a specific drawn pattern (Arrow in the above case) and leaving the others as zero means the min-max function will try to select a path to a drawn position of this pattern for an X-player move and away from this pattern for an O-player move. Using this method we can construct the table below for each pattern, for the initial position and for the first three opening moves. The table shows that the X-player can, indeed, force a draw in any of the three patterns from the initial blank board. However, the first move is critical to which pattern can be forced. For example, to ensure a Scorpion draw the X-player must start with an edge move. Note in the case of the Arrow and Scorpion draws, these initial moves are a necessary but not sufficient condition. The X-player still needs to select the correct moves later in the game to guarantee the result. While this can be subverted by extending the draw analysis above (with the X-player in the box seat) it may keep the kids entertained a bit longer. There is a little bit of science in the above scoring scheme but it hasn’t been road-tested, other variations may well work better in practice. Extending the opening theory to produce a reduced game tree exposes all the traps arising from forked positions. It also captures the essence of the entire game in fewer than 200 nodes. Assigning scores to this tree allows each (interesting) position to be evaluated and the ‘best’ move in a given position determined. This leads to the notion of the perfect game. Finally, drawn positions were briefly analysed and considered for inclusion in a scoring scheme to enhance the game’s interest. Tic-Tac-Toe (TTT), or Noughts and Crosses, is a simple children’s game. As a game, it is not particularly interesting – a few hours play reveals most of its secrets. It has also been widely analysed (see Wikipedia link above) so there is little new to be discovered. So why bother? Well this is my first blog post and I thought it would be fitting to combine one of my earliest computing “wow” moments with one of my latest. As a school kid I was fascinated by the idea of “codifying” TTT moves and responses as a set of tables (this was well before personal computers so it was all pencil and paper stuff). It seemed like magic to me that a “machine” could be made to play like a human and even beat them if they were not careful. Of course today, sophisticated programs can play complex games like chess, go, bridge, scrabble and even poker as well, or better, than expert human players. It’s Lisp, Jim, but not as we know it. beautiful data structures that are immutable! has many excellent native libraries but also has tight integration with Java libraries. If Python comes with batteries, Clojure comes with a small substation! Clojure is a relatively new language that is still evolving, some recent gains include go-like async channels and transducers. This newness does mean it lacks maturity in a few areas, and its Java ties and dynamic typing can also colour people’s views. But overall it is a terrific base that might finally realise the promise of Lisp that has largely languished for over 50 years. Clojure is a simple language at its core, but it can be a challenge to grasp especially if you come from an imperative-style language background (C and Python in my case). Its functional nature and immutable data structures initially led me to a “wtf” moment where I wondered whether is was possible to write any non-trivial program in Clojure. Fortunately that moment was short lived, in part thanks to blogs that showed how Clojure code can be used in different problem scenarios. Hopefully this blog might add to these, reveal TTT in a slightly different light, and encourage existing programmers to take a closer look at the power, elegance and joy of Clojure. As the title of the blog suggests, I’m an enthusiast rather than an expert, so be warned. Each of these alternative ways usually comes with different degrees of clarity, conciseness, elegance, purity and compactness. Views will vary on which is best and this is frequently fairly subjective. There is no right answer here, so I’m happy to take advice from any interested readers, but for the code below, clarity is the main priority. Tic-Tac-Toe (aka Noughts and Crosses) is a simple two-player game. 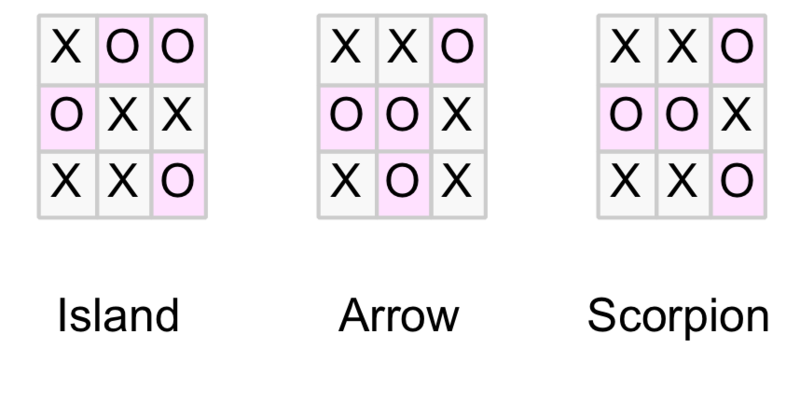 Players take turns placing their token (usually an “X” for the first player and a “O” for the second player) on a 3×3 grid. The game continues until either a player gets three of their tokens in a “row” (vertically, horizontally or diagonally) in which case they win, or until there are no empty cells remaining, in which case the game is a draw. All games can be no longer than nine moves with five X-moves and four O-moves, however games can be shorter if one or other player achieves a winning position in less than nine moves. 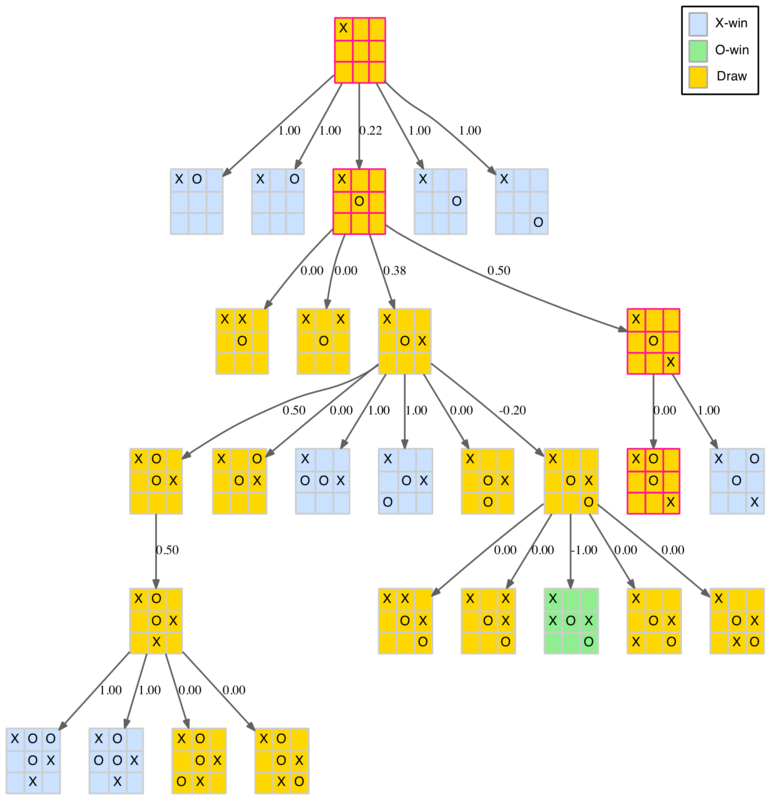 The game can be modelled as a game tree. The starting or root node is the blank board (or grid). 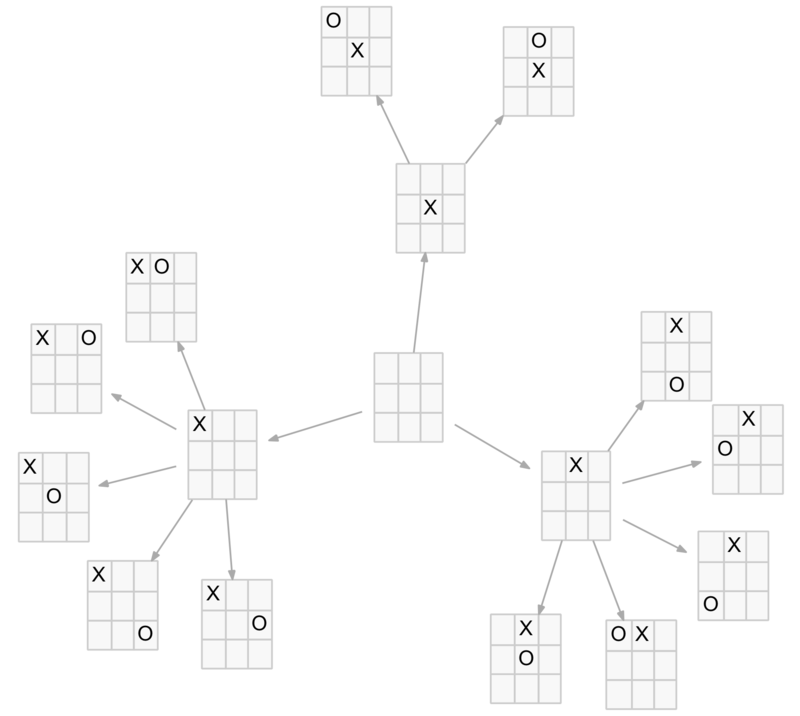 This root node has nine child nodes representing the nine possible X-player moves. 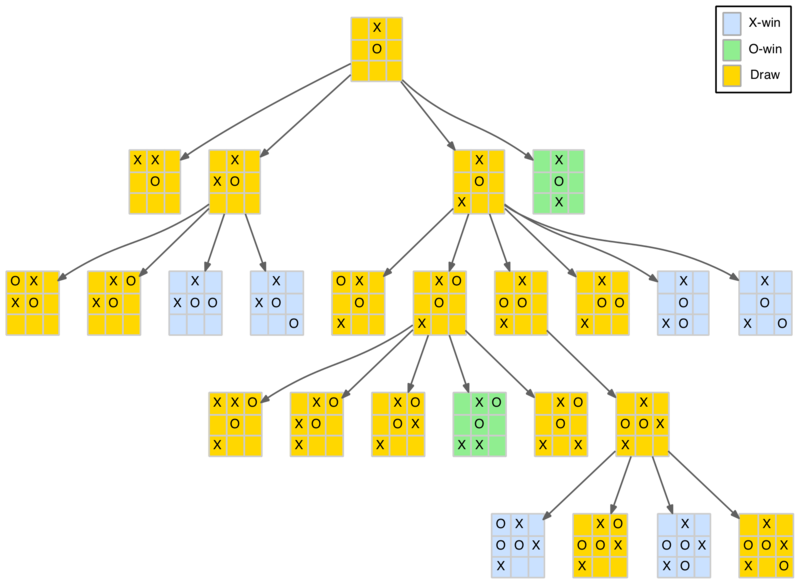 Each of these nodes has eight child nodes representing the eight possible O-player moves in response to the X-player move. The tree continues in this fashion until either a winning position is reached or the board is full without a winning position being achieved (ie. a draw). The game tree has 10 levels which will be labelled levels 0 to 9 (technically they should be labelled 1 to 10 but using 0 to 9 works well here as the level number equals the number of moves made at that level). Level 0 will be an empty board (root node) with no moves. Level 1 will be the nine child nodes that represent the first X-move and so on. The diagram below shows a partial game tree. It is clear that level 0 has a single empty root node, level 1 has the nine first moves of the X-player. Level 2 will have eight O-player nodes for each of the nine nodes in level 1, or 9×8 nodes in total. Level 3 will have seven nodes for each of the level 2 nodes, or 9x8x7, and so forth until level 9 which will have 9x8x7x6x5x4x3x2x1 nodes. Those familiar with the factorial notation will recognise the level 9 result as 9!. It is easy to see the other levels are just factorial ratios (9!/9!, 9!/8!, 9!/7!, etc). From this we can see any analysis is computationally tractable because at worst there are less than 1 million nodes and the tree depth is a maximum of nine (so recursive analysis is not going to run into stack overflow problems). Finally we can write some code to determine the tree size if we take into account winning positions. This will prune the tree at each winning node as it will become a leaf or terminal node. We would therefore expect the number of nodes to be reduced from the upper bound after level 5 which is the earliest case that three Xs can occur to make a winning position for the X-player. Each vector element, or board cell, will take one of three values represented by the Clojure keywords :x, :o and :e corresponding to an X-player token, an O-player token or an empty cell respectively. 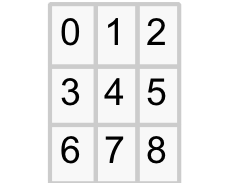 An initially blank board would be represented as [:e :e :e :e :e :e :e :e :e]. As moves are played the :e values will be progressively replaced with :x and :o values. The first thing we need is a couple of helper functions to generate the available moves for a given board and to check for won positions. These functions are fairly straightforward. The first function just returns a sequence of indexes for each empty cell (those containing :e) found on the board or nil if there are none. The second works its way through a (constant) list of vectors that denote the three indexes that represent the eight (3 x horizontal, 3 x vertical and 2 x diagonal) winning sequences, and checks to see if any hold all three of the given player’s token (:x or :o). If you are new to Clojure you should note that the let form allows you to bind not just values but also functions, and that the win function includes external values within the main function’s scope (‘board’ and ‘player’) in addition to its own ‘win-seq’ argument. 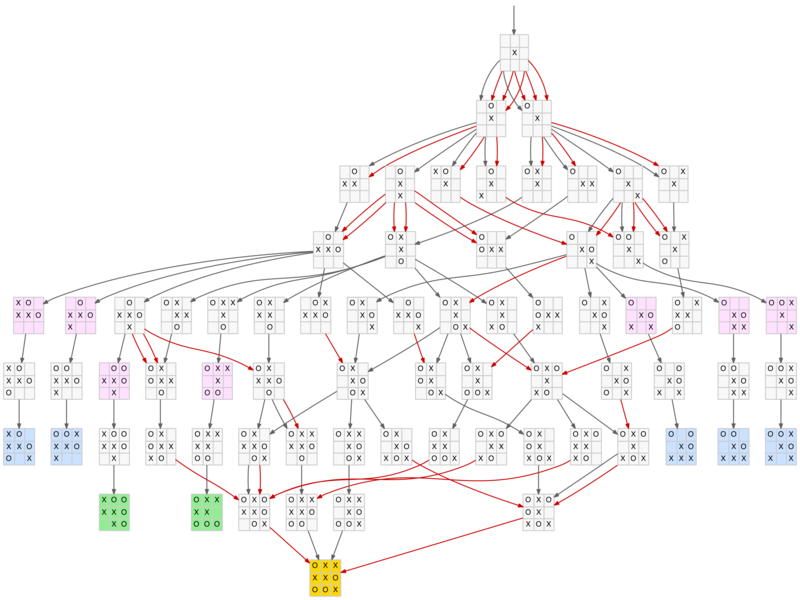 For the initial analysis, the number and type of nodes at each level of the game tree will be determined. To do this the following data structure will be used. It is a map of maps. Each level number is a key of the first map, with its values being a second map of attribute/value pairs. The attributes will be node types and the values will be node counts. We can now write the main game tree walking function. This is a recursive depth-first function that examines each node and determines whether it is a terminal or internal node. If it is a terminal node (ie. a win or draw) it just returns some details about the node (ie. type and depth). If it is an internal node, it must recursively calls each child node passing updated arguments such as a new board incorporating the specific move for that child. Importantly it must also aggregate the return values for each child, including its own value, and pass them back to its calling parent. It is also worth noting that we are not walking an existing game tree but rather temporarily constructing it as we go. Indeed only the current node and its immediate ancestors exist at any time (held in the call stack). 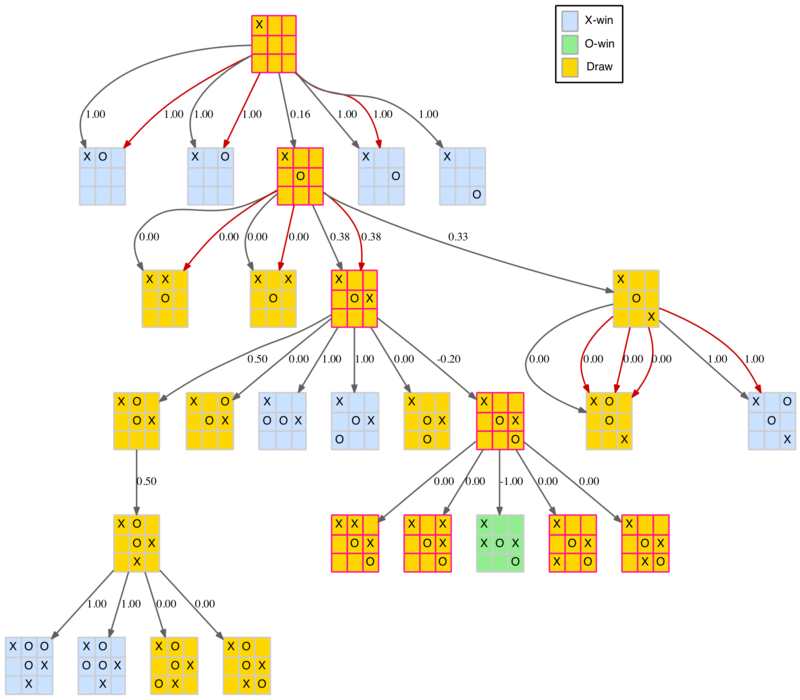 "Recursively walk the TTT game tree and aggregate results for each node"
The walk function takes the board, the last and next player (clearly only one is required as the other can be deduced but it is simple and clear to use both), the level and the two helper functions it uses (see below). It first checks to see if the board was won by the last player. If so, it returns a fragment of the data structure above with the level, node type and count. Otherwise it gets the available moves and again returns if there are none (ie. a draw) with a similar data structure. Finally, if there are moves, it recursively calls itself for each available move with updated arguments and aggregates the returned results with the reduce function. The reduce function’s reducing function does the heavy lifting combining the data structure fragments returned into one aggregated structure using merge-with (twice) to add together counts from like node types. The initial value of the reduce function is used to include the parent node details. The code above attempts to be as pure as possible from a functional perspective. In particular, all its inputs are passed as arguments, including functions it calls, rather than using global references, and the returned results are aggregated and passed back up the calling chain. While this approach might be functionally pure it is not particularly pragmatic in this situation. The aggregation of child results is somewhat cumbersome which detracts from the overall intent. A more straightforward, if less pure, approach is to just update the data structure directly as each node is processed. Clojure was designed with real world state management in mind and it provides several ways to do this safely. By using a Clojure atom to hold the data structure we can recast the walk function to directly update it using the swap! function. This approach will be continued as the code is enhanced to include further game tree pruning measures. The code is essentially the same only a ‘results’ argument has been added which is a reference to the data structure and, for clarity, the two helper functions are no longer passed as arguments. One final refinement is the use of a pre-constructed data structure using sorted-maps instead of the default hash-maps. This is purely an aesthetic measure that means the results display in order on my IDE. It would, of course, also be easy to write an output function to display/print the results in any particular order or format. Both the ‘unordered’ and ‘order’ calls are shown below for completeness. The ordered one will be used for all future calls. "Recursively walk the TTT game tree and update results for each node"
; of the default (unsorted) 'hash-map' the output is correctly ordered. Gratifyingly the results from both versions of the walk function are identical and are in line with what would be expected from the initial upper bound calculations. For the first four levels, where no winning positions can occur the node counts exactly match the calculated ones. At the fifth level, we see the first X-player winning position counts but note the sum of these and the internal nodes still equals the calculated count as expected. From there on, the actual node counts reduce compared to the calculated ones as the winning nodes no longer have children. Also, as expected, the X-player wins occur on the odd levels, while the O-player wins occur on the even levels. The table below summarises these results. This table will be used to track our progress as we implement later pruning measures. Note a drawn node (marked :draw in the code results) is the same as a level 9 internal node (:inode). So for brevity, in the table, drawn nodes are shown on the ‘Internal’ node line at level 9 rather than on a separate line of their own. As the table shows, by taking account of winning positions the size of the game tree is reduced by almost a half. Are there other ways we can prune the tree? A little thought leads to the realisation that the same position can be reached by different combinations of the same moves. This means identical positions will occur in different branches of the tree. A simple example is shown below. The ‘De-duplicated Total’ column is just the original ‘Total’ column divided by the ‘Duplication Factor’. 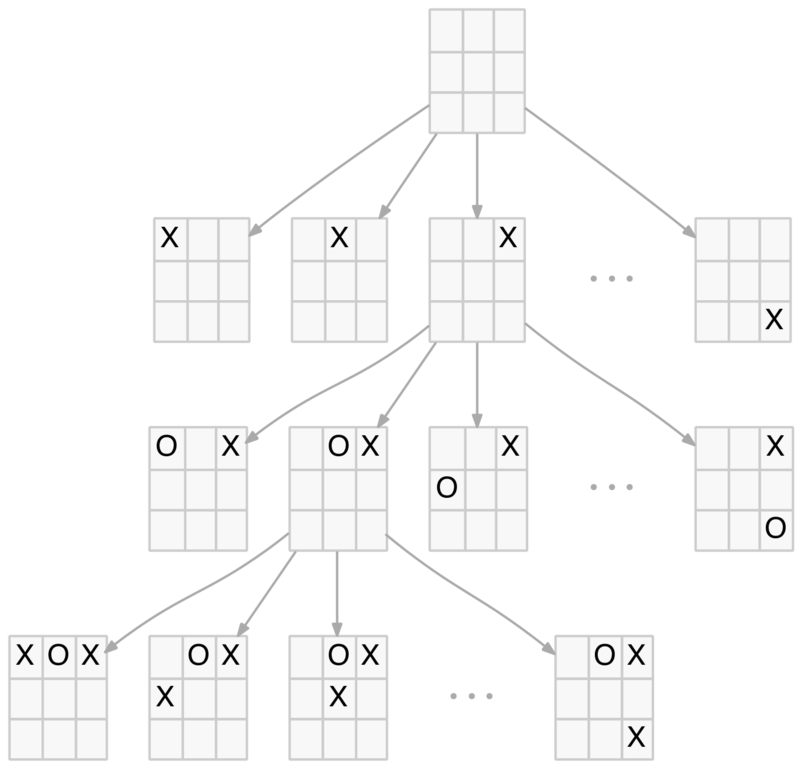 The tree walking code above can be readily modified to check for duplicates by maintaining a set of board positions as the tree is walked and checking each new node for membership of that set. The modified code below has the main changes highlighted. Note a new argument ‘dups’ is introduced to hold known boards (ie. those already visited). As shown by the updated tracking table below, these results align well with the new de-duplicated upper bound. They match perfectly up to level 5 when winning nodes start to prune the tree and the node counts drop away as in the earlier example. The large reduction in the size of the tree is also encouraging as it hints at the underlying simplicity of the game. The next stage in tree pruning is to account for position symmetries. It is fairly obvious that although there are nine first X-player moves, only three are distinct (a corner, an edge or the centre). The rest are just rotations or reflections of these three. The same holds for the O-player responses to these three moves. There are only five, five and two, respectively, distinct responses as shown in the diagram below. 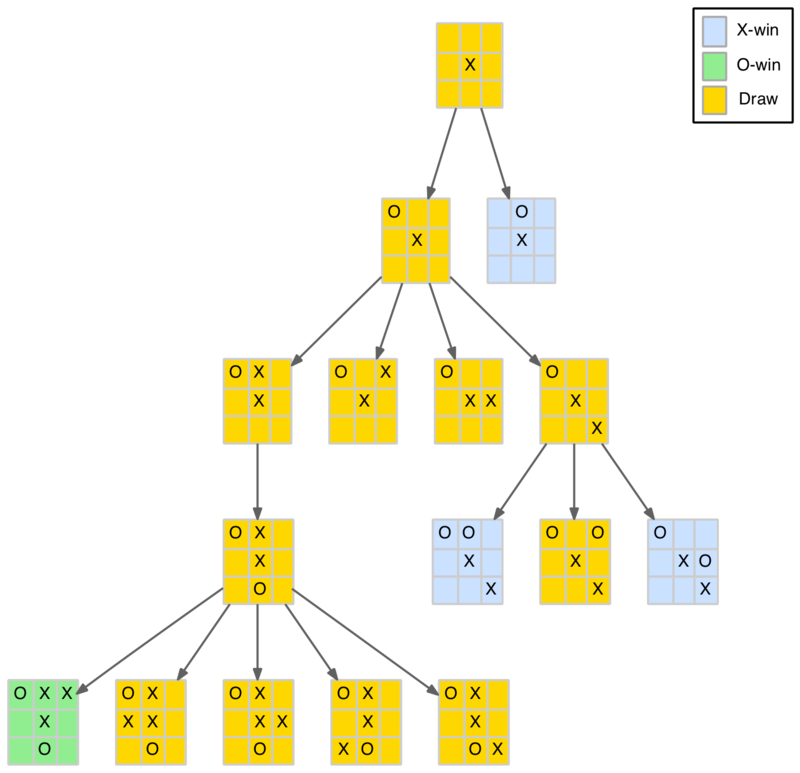 This means instead of the original 9×8=72 nodes at level 2 in the game tree there are actually only 12 distinct nodes. Similar symmetries exist at other levels. A little experimentation (or theory for those with linear transformation skills) shows there are seven symmetries involved: 3 rotations (90, 180 and 270 degrees) and 4 reflections (horizontally, vertically and along the two diagonals). For some positions, not all of these symmetries yield unique new positions (ie. after a transformation the new position is either identical to the original or to one of the other transformations). But many positions do result in seven unique new positions, one example is shown below. To account for symmetries, a new helper function is required that will return a set of boards that are symmetries of the specified board. These boards can then be bypassed in the same way as duplicates. Note that duplicates and symmetries are orthogonal (ie. they don’t overlap) so there is no interference between them that might affect node counts or the order in which they are tested/excluded. reflections of the specified board." The function above uses vectors to hold index mappings of each transformation (rotations and reflections) which it applies to the specified board to produce seven new boards. These are combined into a set which will eliminate any identical boards and disj is used to remove the original board if it happened to be generated by one of the transformations. With duplicates we just added (conj) each new board as it was processed for later checking. For symmetries we need to add all the symmetric boards that arise so we use the union function to maintain a set of all boards that are known to be symmetries of processed nodes. The previous tree walking code has been modified to track and bypass symmetric nodes. The main changes are highlighted. Note a new argument ‘syms’ is introduced to hold symmetric boards. Again these results look consistent with our expectations. The counts for level 1 and 2 agree with the 3 and 12 node counts identified in the diagram above, and the overall node counts have shrunk again at all levels. As shown by the following updated tracking table we are now down to a game tree of just 765 nodes, a big reduction from the half million plus we started with. One interesting result is that there are only three distinct drawn boards (shown below). As they can occur in different orientations it is easier to recognise them as patterns. The Os are highlighted below to emphasis the shape and some euphemistic names are attached (although the reader may have better suggestions). The reader can confirm that the resulting 16 indexes represent 4 x Arrow, 4 x Scorpion, and 8 x Island patterns as would be expected when symmetries are taken into account (note the tracking table shows 16 drawn boards before symmetries were excluded). It is a testament to the power of Clojure (and similar modern languages) that this check can be programmed in a few lines of code (technically two). Not only is the code concise, it is also ‘safe’ in the sense that edge-cases, boundary conditions, etc. are all abstracted away. A straightforward way to achieve this is to modify the move generating function to check the above conditions, and if found, to return only a single move (ie. either the winning or blocking move). If the conditions don’t apply then return the list of all valid moves as before. The modified function (now called gen-moves-forced) is shown below. Note ‘next-player’ and ‘last-player’ variables have been abbreviated to ‘next-p’ and ‘last-p’ so the code fits better on the limited blog real estate – not a practice I would normally encourage :). 3. Otherwise - make any move (ie. return all valid moves)"
The code above initially generates all moves as before (‘moves’). Then for each move determines which ones (if any) create a winning board for the next-player (‘wins’) and similarly winning options for the last-player (‘blocks’). If there is a win or wins for the next-player, return one. If there is no win but a block or blocks, return one. Otherwise return all available moves as before. Now the walk code can be re-run using the modified move generation function (highlighted below). We see a further reduction in the game tree size with the inclusion of forced moves. The game tree is now down to just 389 nodes! The updated tracking table below. The first point makes sense as the easy wins (through careless defending) no longer occur as the opponent will now always block a two-in-a-row threat. But what is going on with the second point? Is the code wrong? No! In fact, it reveals about the only interesting tactical feature of the game. It is possible to create a position with two winning threats (ie. 2 x two-in-a-row) at the same time. This is called a fork. As the opponent can only block one, a player that can achieve a forked position is guaranteed to win. Below are some examples of forked positions with the two threats highlighted. The first two show the O-player to move and are winning for the X-player. The last one shows the X-player to move and is winning for the O-player. To understand the number and level of forked positions we need another helper function that tests for these positions. The tree walking code can then be modified to record the forked position details. Remember a forked node is still an internal node, so we would expect the previous :inode count to split between non-forked (:inode) internal nodes and forked (:fork) internal nodes. The code below shows the helper function, modified walk code (highlighted) and results. "Return true if it is a winning 'fork' board for the specified player. That is last-player has two winning moves AND next-player has none"
These results show forked positions start at level 5 (3 x Xs and 2 x Os) which is expected as at least three Xs are required to form a fork. Also the sum of the forked and non-forked nodes equals the previous internal node counts. There is also a reasonably large number of forked positions suggesting that forks are a significant tactical component of the game. Until now we have mainly dealt with the size and shape of the TTT game tree. However, as we have managed to prune it down to a relatively small number of nodes, it is possible to display it, or part of it, directly. Using the fantastic Graphviz and the convenient Clojure library dorothy that greatly simplifies creating Graphviz configurations from Clojure, it is relatively straightforward to create a visual representation of the game tree. The full tree is still a bit large to comfortably display as one image but for the intrepid a link to the full tree in PDF format is provided at the end of this section, along with PDFs for each of the three first-move branches. The smallest of these branches, first move in the centre of the board, is shown below. The dark edges (links between nodes) represent standard parent-child relationships. The red edges show the same parent-child relationships but with a symmetrical transformation included. That is, the child is derived from the parent with a new move added but then rotated or reflected to an existing node. Multiple red edges indicate that several of the parent’s child nodes transformed to the same final child node. Note there is only one drawn board (the Island pattern – see above) as this pattern is the only one with an X-token in the centre square. 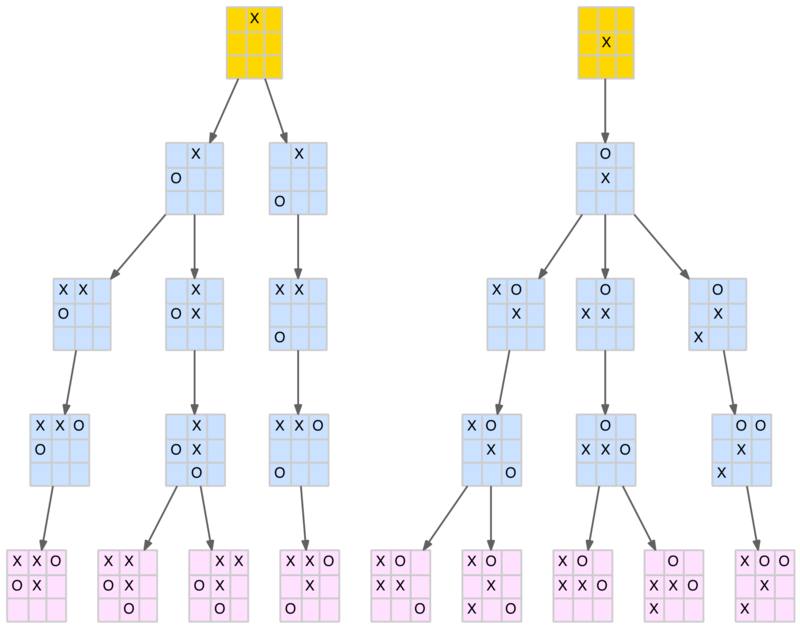 We have shown that TTT can be represented as a 10-level game tree and that by accounting for duplicates, symmetries and forced moves, this tree can be reduced from over 500,000 nodes down to its essence of just 389 nodes. Despite always correctly blocking an opponents threats there are still won positions within this tree because of the existence of forked positions. These positions provide the main (only) tactical component of the game. Finally we learned that there are only three drawn position patterns. Can the game tree be reduced further?